A week later, the ship is found, abandoned, its cargo untouched. The crew is never found. Over the years, many bizarre theories have arisen to explain what happened on that fateful night, from aliens, to sea monsters, to time travellers. But what if they were all true? 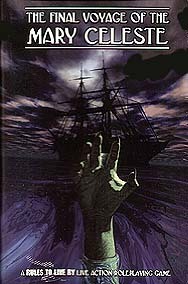 The Final Voyage of the Mary Celeste is a four-hour live actrion roleplaying game for thirteen to seventeen players and three Game masters. It is a great game for a dinner parrty or as a live roleplaying game for a convention. * A complete GM guide, including setup, castings, special runtime mechanics, a summary of each of the characters, and more. * A set of cards - printed into the book - used to represent items in the game. * Player handouts and information sheets.